BRAND NEW DVD NOW AVAILABLE!! 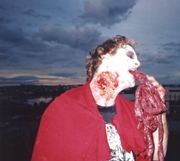 ZOMBIEFEAST!!!!! 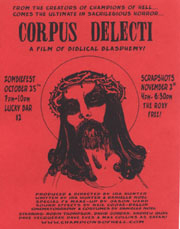 A Collection of Vilesome Videos including Scrapshot Film Competition Winners Corpus Delecti and Unearthed!!! Email championsofhell@hotmail.com for ordering info. This is just the beginning!!! 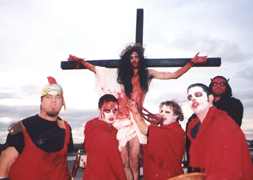 A FILM OF BIBLICAL BLASPHEMY! 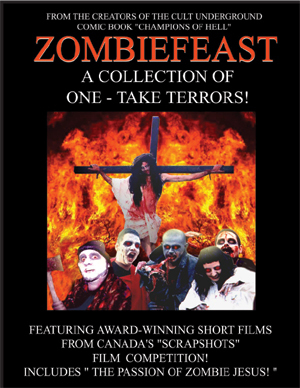 Starring: ROBIN THOMPSON as ZOMBIE JESUS! Starring: Rob Nesbitt as the hiker! Copyright © 1990-2004 Hunter-Thompson Ltd.